Flip Flappers seems to fit in the same kind of niche of "headtrip" anime that FLCL does or did, even down to that same kind of bright, deceptively simple art style. Underneath of that apparent simplicity is a strong focus on action and movement over detailed still shots, which lends the whole thing a very 'living', visceral, 'alive' sort of a feeling. Actually, it felt to me like that's part of the whole larger underlying theme... Episode one opens up to a near-silent classroom during an exam. The silence itself is almost shocking, and the show only leads us out of that space very slowly. When Papika is introduced (multiple times), she's like a distillation of pure 'livingness', in sharp contrast to the quiet, maybe suffocatingly mundane existence we're shown Cocona existing in. It plays out like someone captured a particularly coherent daydream, and it seems to be freely borrowing symbolism from and throwing shout-outs to all kinds of stuff: The Girl Who Leapt Through Time, Hansel and Gretel, Alice in Wonderland, Super Mario, FLCL, Revolutionary Girl Utena, Princess Tutu, Paprika, and Ghibli movies, among others... (One of the characters is even named 'Papika' -- notably the redhead associated with the dream world.) There's also an undercurrent of darkness intermingled with everything that seems to be poised to take the show to interesting places. A featured article on Crunchyroll's newsfeed calls Flip Flappers "Sensory Storytelling", and I'd have to agree. As of the end of episode one, literally nothing was explained at all... but I'm wondering if it really needs to be? That actually seems to be the point of it: A relief from the everyday world where everything has to make sense, and where we're so focused on words, both written and spoken, that we almost forget about movement, living, and being. There's a lot of focus in this anime on nonverbal communication. (Action and reaction shots are delightfully smoothly animated, and despite the huge eyes, the characters' faces are anything but static...) Actions really are speaking much louder than words here. This could get interesting very fast. Or very slow. Or maybe just drag us along like dreams do, and leave us wondering what the heck it all meant, in the end... if anything. As for the yuri element, it doesn't seem overly servicey* or cloying at this point, and has just about the right amount of sweetness, but it's hard to say anything about it at this point, with only the first episode to go on. magical crotch jewel and the somewhat gropey robot. Food for thought: how does a show survive the test of time? Franchises inspire remembrance, as do genre staples, but what about shows that are neither? What makes them stand tall? I bring this up because I have the sense that Flip Flappers will be a show that is remembered by Magical Girl fans long after ending. I can't say it'll be one of the greats, but Flip Flappers is downright great and it deserves to be remembered, studied, and evaluated for quite a while more. Flip Flappers is about Cocona, a fairly ordinary Junior High School student who one day runs into a weird, hyperkinetic girl named Papika. Together the two end up joining with the secret organization flipflap and going on adventures through the magical world of Pure Illusion to chase magical crystal fragments that can grant wishes. In the process they come into conflict with a rival group of fragment hunters who have their own extraction team lead by Cocona's childhood friend Yayaka. That's the elevator pitch for Flip Flappers, and one that massively undersells the scope of the story or the intimacy of its characters. If I could compare Flip Flappers to anything it would probably be Revolutionary Girl Utena, not in terms of details but in terms of both shows' unapologetic stylishness and their broad themes. Flip Flappers is ultimately about adolescence and growing up, but that's an explanation as trite and oversimplified as it being a fight over magical crystals. Flip Flappers is a gorgeous show, it has incredible designs, beautiful animation, its handful of fight scenes are all top notch, the direction is incredible, and the storytelling is Class-S work. Add on to all that an incredibly good story with a superbly written cast and you absolutely have a winner here. Flip Flappers is REALLY good on nearly every level it attempts to be good at, I really have to give it a ridiculous amount of credit for that. There's also all the stuff that Flip Flappers has that will doubtless be inspiring think pieces for the next couple decades on anime blogs. Flip Flappers is an unapologetically Yuri series with a degree of overt romance that actually makes it stand out. Magical Girl shows usually only hints at its relationships or keeps feelings platonic, Flip Flappers is, to use a cliche, out and proud. Flip Flappers also hits a lot of subjects directly and through metaphor that a lot of other shows on the same ambit would be cautious touching directly. I'm certain there will also be a lot of retrospectives pointing out the multifaceted character dynamics, or the shockingly excellent genre shifts, or pointing out all the bizarre references (Brush up on your pre-Zyuranger Super Sentai for episode 8). At the end of the day I think Flip Flappers will be remembered because it does so much in thirteen episodes. Its ideally paced and plays with as many ideas as it runs straight. Flip Flappers is a fantastic, genre hopping, plot spinning, character building, hyperstylish success, a show that deserves to and may yet become a genre touchstone. Don't miss out. Wait what genre is this again? If FLCL had a love child with Madoka Magicka, that child learned to draw by watching One Punch Man, and learns sexuality through watching Kill la Kill you would end up with FLIP FLAPPERS. Honestly I had a hard time figuring out what kind of story it would tell (I'm at episode 4), and honestly it's so refreshing. I didn't feel lost or have a hard time following the story, but it doesn't just throw out a genre and rigidly stick to it. It feels light and goofy, like the writers had a feeling they wanted to get across, and that feeling is more important to convey than anything else. Not that it is lacking in story, so far it has been excellent, but I can't get over the bubbly feeling the ending scene provides me. At first I was like "man anime kinda blows" but then I watched this and now I'm like "fugg yeah anime is the best"
The implications of imminent Shoujo Ai are not just tasteful, but remarkably beautiful as well. The characters are developing in ways that inspire me to my very core. Everything is colorful and animated with love. The voice actresses compel me as if this bizarre story is reality. The music is more than just a background, making the emotions I feel while witnessing this anime more intense in all the right ways. The introduction is one I cannot skip, and the credits adorably make it even more impossible to leave the tab alone. This is a story about a set of realities in which I feel I myself am an ordinary girl falling down a rabbit hole while falling down a rabbit hole while falling down a rabbit hole while falling in love with a strange and extraordinary girl, becoming extraordinary myself in the process and stopping less and less to ask why. 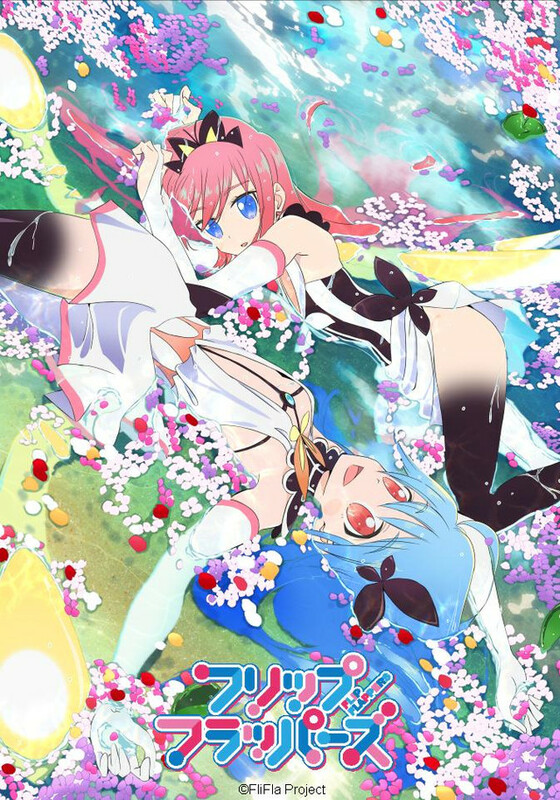 Flip flappers is a wonderfully strange anime detailing the adventures of two girls, Cocona and Papika, in the alternate dimension of "Pure Illusion". This show first caught my interest because of its beautiful art and fluid animation. And on that front it 100% delivered. Each episode had its own style, ranging from the surreal alice-in-wonderland world of episode 2 to the exciting mad max world of episode 3 to the horrifying clock-world of episode 5. And more the art does a lot more than just look pretty; this show is chock full of visual metaphors. Some foreshadow later plot points. Others are hints about the characters and the world. Many are clever references to (or subversions of) other anime, modern art (google Thomasson's Pure Type art), popular culture, and psychology. On a story level the show is very character focused. Its centered around Cocona's development into adulthood, and the evolution of her relationships with the other characters, primarily Papika. Most of the pure illusion worlds reflect some aspect of Cocona's personality. The first episode's pure illusion is calm, subdued, and quiet, reflecting Cocona's life before Papika enters it. The next few pure illusions represent her mixed feelings about falling down the rabbit hole into Papika's crazy world. In the middle episodes, the pure illusions shift to focus more on Cocona's relationship with Papika, and the conflict she's having over what exactly that relationship is. The last few pure illusions deal mostly with Cocona's relationship/conflict with the antagonists of the show (keeping it vague to avoid spoilers). The downside of this heavy focus on Cocona is that a lot of the plot points not directly tied to her are somewhat under-developed. The end of the show in particular, though I liked it, definitely left me with some unanswered questions about the supporting characters. Some of those answers were hinted at through the tremendous visuals, but I would have preferred the conclusion to be a bit more direct. These are minor gripes though. Overall I loved the show, and its probably my favorite anime of 2016. I recommend it to anyone who likes abstract, visually interesting, or just plain weird shows (though I also recommend reading reddit's episode discussion thread after watching each episode; they pointed out a lot of the subtleties of the show's imagery, which helped me appreciate it more). A note on the romance in this show: Without getting into spoilers, I personally found the conclusion of this plot point satisfying. I've heard people say that it was left too ambiguous, and I think there's some merit to that complaint. But it wouldn't be Flip Flappers if they out-and-out told you anything, and to be fair it was heavily implied. Far more so than a lot of lgbt romance in anime (I'm looking at you, Hibike Euphonium). If anyone has ever seen Gigguk's video, you will understand the title. This anime is perfect when it comes to visual storytelling, and even nails dialogue a lot too. There is a lot of people that will be able to not only relate to the characters, but be able to feel this anime, and no words can describe that. The deep themes covered by the perfect color template and directing (and did I mention that backgrounds are the most gorgeous I have seen in a while) perfect this show's style. Top it off that this is an original anime, it becomes a must watch, and will be remembered by me for times to come. This is another show that really tells me why this medium is so great. Best Anime of 2016 in my opinion. A superb anime, somewhat trippy examination of different realities, good character development, excellent animation and story. as this episode is most to the point of the entire series. The animations are excellent and the different realities are beautifully done, with each being distinct, somewhat hallucinogenic versions of the "primary" reality. The story is engaging and very creative. I can't wait to see what happens next. Yup, I'm that kind of guy. Literally just making a review to give it five stars. At best I can say that the atmosphere is what really brings this together for me; and that includes the opening and ending. The cheeriness of the show is wonderful, but when you couple that with the sometimes creepy imagery and concepts, you get an unerving feeling in the back of your head when watching. And I love it.